As Your Trusted Sports Nutrition Partner, the best in class raw materials are imported from top international sources. The Raw material selection and procurement are functions that are handled with immense care at Six Pack Nutrition. Stringent processes, controls and guidelines are in place to ensure that only the best quality reaches you. All products of Six Pack Nutrition are priced reasonably and is at per with the best brands in the market. We have also created a huge international library of flavors so that the best tasting products that are not just effective but also taste good and suit the requirements and taste preference of every fitness enthusiast are made available. Six Pack Nutrition's has a wide range of high quality products to cater to your nutrition needs and requirements - 100% unadulterated Whey Protein Isolate, weight gainers, isotonic drinks as well as protein bars, are all available under the Six Pack Nutrition range. The products are formulated and created in technical collaboration with innoWHEYte Nutrition USA. innoWHEYte Nutrition is an expert in all formulations with Whey, with innovation in powders, crisps, bars and wafers. The technical collaboration with Six Pack Nutrition includes assistance in product development, sourcing and quality guidelines. 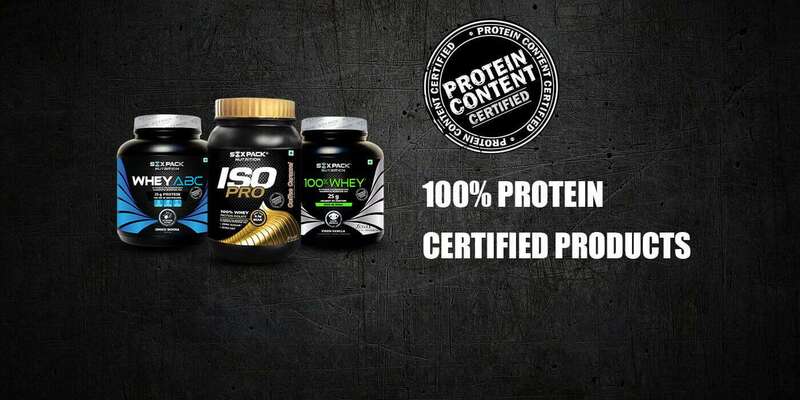 Good quality products and your trust are important to us which is why every batch of high protein products of Six Pack Nutrition are analyzed and tested by an independent NABL accredited lab and the Certificate of Analysis is available in the Protein Content Certified page on the Six Pack Nutrition website. All products are manufactured in FSSAI Approved State-of-the art manufacturing facility in Pune, Maharashtra. Additionally, Six Pack Nutrition is committed to providing scientifically superior products to athletes, body-builders and sports enthusiasts and hence we ensure that all our products contain no banned substances and are DOPE FREE. Six Pack Nutrition - The Brand with International Quality at affordable Price.